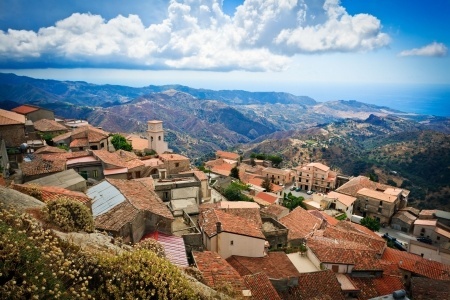 Washed by the Tyrrhenian and lonian Seas, the mountainous region of Calabria, Italy, boasts a spectacular landscape of wild beauty, dotted with majestic historic villages sitting pretty between rocky cliffs and rolling hills. A breathtaking landscape, Calabria is the southernmost province in Italy. It has become a favorite destination for summer seaside vacations. Calabria is a different Italy, with Basilicata bordering it to the north and the Mediterranean flanking it on three sides. Lying at the toe of Italy’s boot, the province proudly calls itself the Caribbean of Europe. It is boasting about 780km of mesmerizing coastline, with plenty of cheek-by-jowl experiences to cherish. The beautiful turquoise waters of the Ionian Sea, the soothing warm climate, the striking rustic coastline alternating with sparkling sandy beaches, the wild and mysterious nature, the scrumptious flavors of ethnic food, and the traces of its ancient origins... They all make Calabria a favorite year-round destination. With a rich history, Calabria offers a series of heritage sites from the local artistic civilization. The historic sites of Sybari, Cosenza and Reggio Calabria boast a plethora of Roman ruins for a history lover to explore. The theaters, baths, and bridges dating back to the Byzantine Empire show glimpses of the Gothic style. Dotting the countryside, Byzantine churches, ancient Greek temples, and old hillside towns are a must-see destination for a history buff. Calabria is Italy's best kept secret, blessed with lively cities that are hubs of cultural attractions. With its endless charm, the cosmopolitan Reggio Calabria steals the show, offering you plenty of secrets to unravel. Not only is it a shopper’s paradise, but it also has the most impressive Cathedral in the region. Vibo Valentia is blessed with churches and medieval castles. They take you back in history with their rustic charm. Cosenza’s Open Air museum and National Gallery are hugely popular for their rich connection with the local culture. 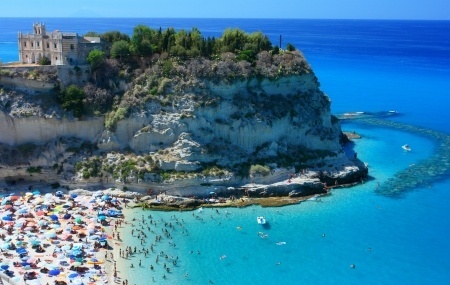 To a beach lover, Italy is a paradise and Calabria tops the list of the most attractive beach destinations in the region, with its spectacular rocky cliffs, fine white sandy beaches, achingly quaint villages, and unpolluted landscape. Flanked by sea on three sides, Calabria is a nature lover’s paradise. It has a stunning coastline that bewitches you and offers the ideal surroundings to relax and rejuvenate and explore the Calabrian hinterland, where grand green belts alternate with turquoise lakes and rapids. Calabria, Italy, enjoys the best of inland adventure and recreation activities, with its varied coastline acting as a playground for water sports. The scenic countryside has plenty on offer for somebody who loves to taste a bit of adventure. If you love adventure, take a hike up the rolling hills or explore the mesmerizing landscape on a mountain bike. The sizzling warm climate and spectacular beaches make Calabria a perfect spot for couples looking for an idyllic romantic resort to relax in the sun and embrace the wilderness. Take a romantic trek on horseback in the enchanting hills, with a series of sweeping trails to be explored at leisure. Further inland, the luscious landscape of La Sila and the hilly area of Pollino National Park offer ideal spots for rewarding views. Take a refreshing walk with your beloved or catch fresh fish from a lake. A boat trip to the sea is another captivating activity that interests many a tourist here. Undoubtedly, there is plenty to explore and unravel in Calabria, Italy, with its breathtaking coastline, charming villages, majestic landscape, and scrumptious ethnic flavors. I have been exploring the region for you. I hope you enjoy my tips and advice on this website. If you don't want to miss a thing: sign up for my newsletter below!